In the summer of 1914, Arthur Latcham would have had no inkling of how the future would unfold, nor had anyone else. The events on this day in 1914 would have seemed a remote irrelevance to a young man in Somerset. It was not as though political assassinations had not happened before and not as though the imperial administrators were not aware of tensions in the city. An elementary understanding of security would have told them that Franz Ferdinad should not travel further that day, and, when he did move, should only do so under strict security. Instead, astonishingly, he and his wife were allowed to leave the residence in an open car, to visit the hospital to which those wounded by the grenade attack had been taken. Even the foolish decision to travel the streets need not have been fatal, had the drivers taken the correct route, there would not have been a problem. No-one had thought to tell the driver of a car, that had been subject to a bomb attack that same morning, that the route had changed. The drivers of the vehicles had to turn around, which need not have given an opportunity for further attack, were it not for the fact that one of the cars stalled, bringing the whole line to a halt. A competent administration would have ensured the archduke’s car was immediately surrounded by policemen or soldiers, but Franz Ferdinand was left unprotected. Gavrilo Princip, another Bosnian nationalist was sat at a cafe and saw what had happened. He walked across the street and took out a low-powered pistol, at which point one might have expected him to have been brought down by gunfire from those charged with the archduke’s protection. Princip did not even shoot Franz Ferdinand first; he shot the duchess Sophie in the abdomen before shooting the imperial heir in the neck. The archduke died at the scene, the duchess on the way to the hospital. The incompetence of the imperial authorities contributed much to the fact today is remembered. Elementary precautions and 28th June 1914 would have passed quietly into history. The shambolic death of Franz Ferdinand seems, in retrospect, a mere precursor of tragi-comic conduct in the weeks that followed. In London, there was Sir Edward Grey, the British Foreign Secretary who did not speak French, which would not have been a problem if it were not for the fact that the French ambassador in London did not speak English in his meetings with Grey, and hated England so much that he went home to Paris at weekends. They would meet without interpreters; the history of Europe hanging on encounters between two men who did not understand each other. Grey was not the worse, British Prime Minister, Herbert Asquith, sat at meetings of the British Cabinet writing; not writing notes on what was being said by Government ministers about events that would change the world, but letters to his girlfriend. There was a satirical graffito in college days, “Archduke Franz Ferdinand found alive – First World War a mistake” – it had a kernel of truth. The unfolding events of that summer were shaped as much by a bumbling ineptitude as by political, economic or military pressures towards conflict. It being the anniversary of the assassination in Sarajevo, visiting the town of Street, I walked to the graveyard to pause at a grave of one of the fallen. Arthur Latcham joined the Somerset Brigade of the Royal Horse Artillery in the opening weeks of the war. 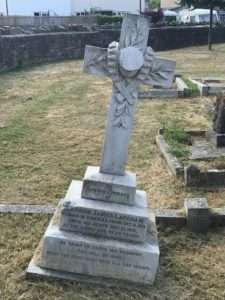 Severe conditions brought him pneumonia and he died in December 1915 and was brought back to his home town to be buried. His memorial stone, which now stands askew, was carved with a cross, a soldier’s cap, a cartridge belt, and the laurel leaves of mortality; Arthur Latcham would have preferred to have encountered none of them. What a different world it would have been if the men from Somerset had never heard the name of Franz Ferdinand.